Sprawled across the area of 732 square kms, Gurgaon is a planned and unique location with a close proximity to the International and domestic airports. The city has great connectivity with the Delhi Metro as well as the Rapid Mono Rail which makes commuting easy for the residents of both the metropolises. The Millennium City (nickname for Gurgaon) always had huge demand for both the residential as well as commercial real estate. Many top companies have set up their unit in the city, which in turn has led to the increase in demand for employment and residential projects. When it comes to residential plots, Gurgaon is certainly in the right direction and has brought itself into a special place on the map of luxury living. Many real estate groups are investing in the city by putting an accurate luxury real estate and developing its infrastructure. These groups are introducing various new projects, including the construction of apartment in Gurgaon, educational institutes, shopping malls, community centers, hospitals, parks, hotels and theatres. All these buildings and apartments are well-equipped with requisite amenities, such as regular and clean water, 24-hour power supply, sanitation and green areas surrounding. The apartment in Gurgaon is fitted with the latest architectural technologies, which includes central air conditioning, fire alarms and many other systems to make the place safe. Gurgaon boosts all types of houses – affordable, costly, independent and renting – for the people to live. 4-BHK and 3-BHK to 2-BHK and 1-BHK are available at some of the famous locations. 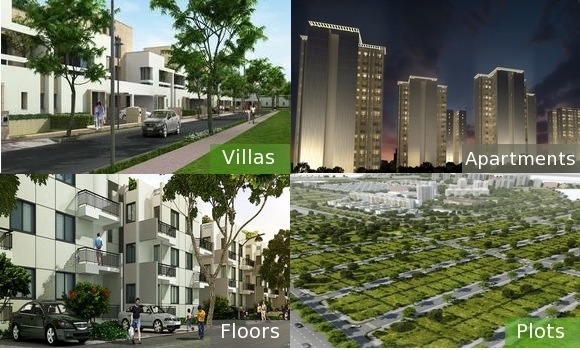 These areas have housing facilities in varied categories. While these BHKs include bedroom with attached bathroom, hall and kitchen, 4-BHK is also available with servant quarters. Other facilities like schools, markets, hospitals, and children parks are available in the vicinity of these areas. Along with BHK sets, patrons can choose villas and built-up floors which are constructed on residential plots. Gurgaon is flourishing in the infrastructure by providing easy and affordable options to the people and catering their exact requirements and needs. This entry was posted in Residential Space and tagged flats in Gurgaon, homes in gurgaon, Plots in Gurgaon on June 30, 2014 by Admin.